The first high school football game of the season is tomorrow, and we’re sending folks to cover Penn State’s first game on Saturday. 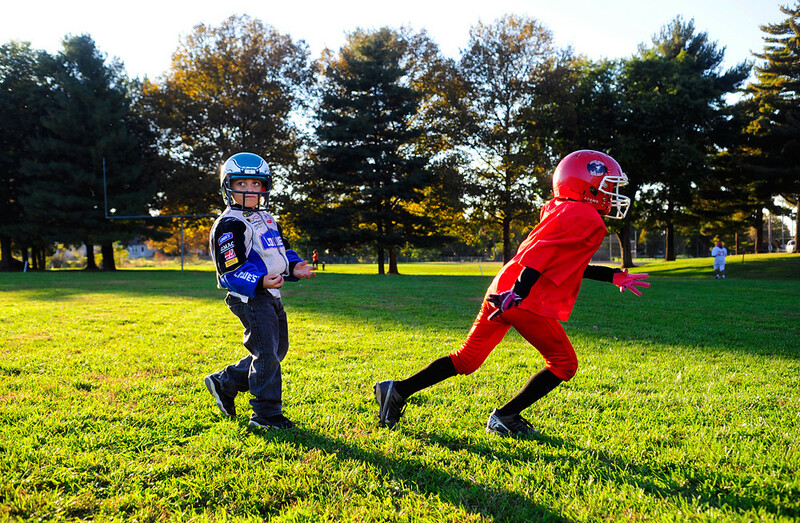 With that in mind, here’re a few pictures I made last year while working on a story about pee wee football. © 2012 by The York Daily Record/Sunday News. Boys Club rink varsity football players do the crab-walk while drilling at practice on Wednesday, Oct. 24, 2012. For one and a half years, practically every fall evening as I drove back to the office via Parkway Boulevard, I’d see miniscule football players running through drills and practices. Finally, my interest had been sufficiently piqued and, one evening, I pulled over, observed the final minutes of practice and chatted up one of the fathers who was making sure his son wasn’t slacking. Then he introduced me to the coach, and after that, I was at practice at least once a week. After an undefeated regular season — and not allowing first downs or touchdowns in all but the last game — the Boys Club of York Red Raiders’ rink varsity football team lost the York County Youth Football Association championship game 12-0 to West York’s rink varsity football team on Saturday, Nov. 3, 2012, at Northeastern High School. 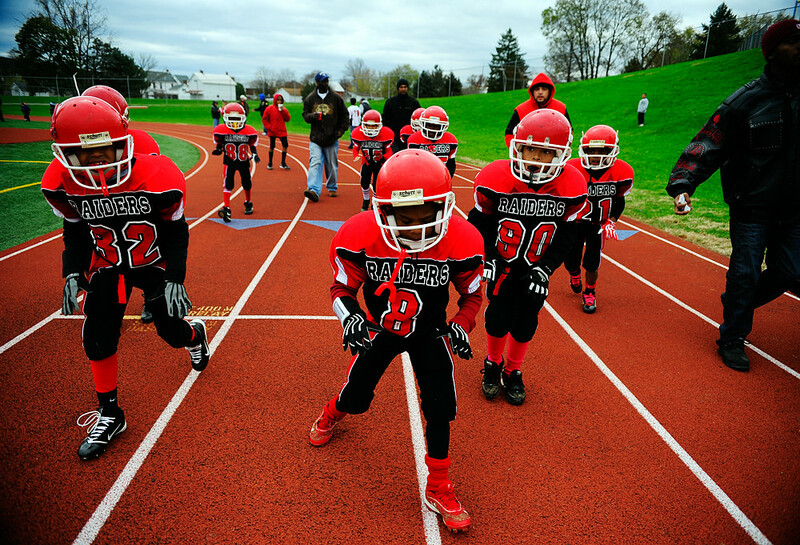 The “rinkies” are 7-8-year olds who had practiced every weekday from August through the beginning of November on a field just off Parkway Boulevard in York. This team of rinkies has played together for three years so far and, despite three consecutive undefeated seasons, has yet to claim a league championship title. © 2012 by The York Daily Record/Sunday News. Marlyn Dellinger ties the shoe of his son’s Boys Club rink varsity football teammate Jonathan Orr, 8, before practice on Thursday, Oct. 18, 2012. © 2012 by The York Daily Record/Sunday News. Armonni Borges, 5, waits for the whistle as Jaxiel Ascencio, 8, runs through a drill during practice on Tuesday, Oct. 6, 2012, at a field just off Parkway Boulevard in York. 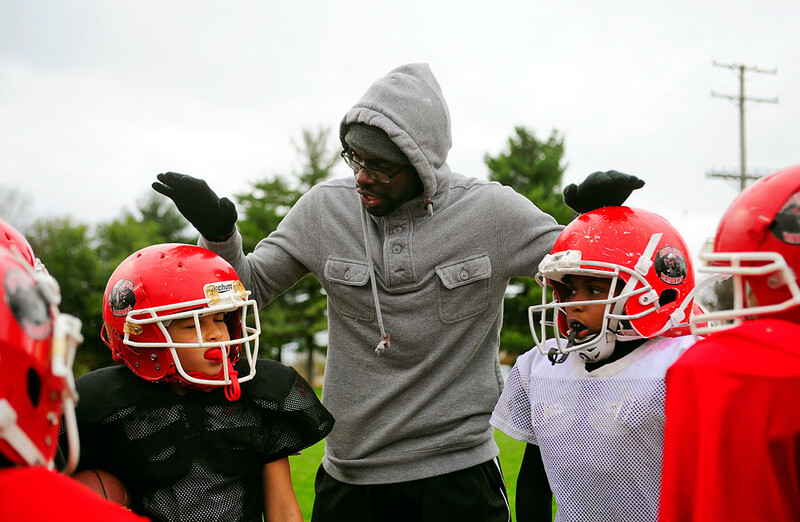 Armonni’s older brother Terrance Price, 8, plays for the Boys Club’s rink varsity team, but Armonni is too young to join the Boys Club’s youngest division — the 6-7-year-old “smurfs.” Nevertheless, the “rinkies” coaches allow Armonni to practice alongside the older boys and to watch games from the sidelines. © 2012 by The York Daily Record/Sunday News. Boys Club rink varsity football coach Shanoy Moody knocks helmets while trying to pump up the boys near the end of practice on Thursday, Nov. 1, 2012. © 2012 by The York Daily Record/Sunday News. 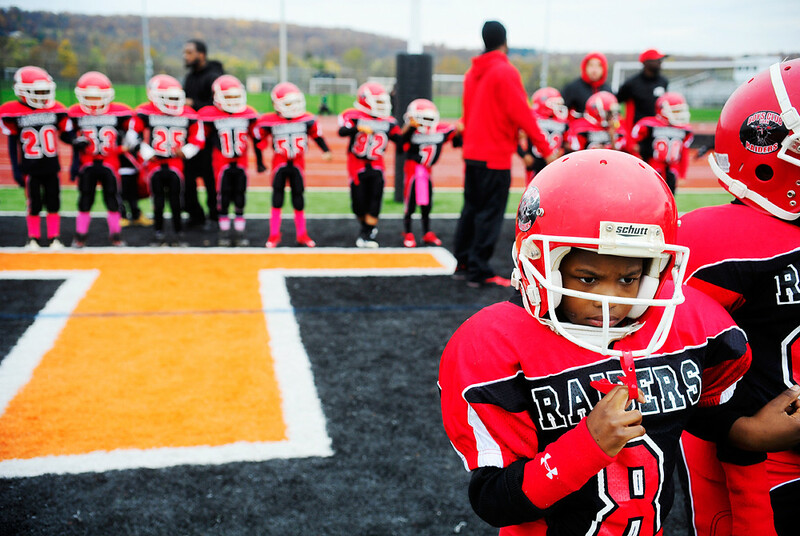 Zamir Weedon-Parker, 8, stands with his co-captains in the endzone before the semifinal game against the Eastern York County Blackhawks on Sunday, Oct. 28, 2012, at Central York High School. © 2012 by The York Daily Record/Sunday News. Boys Club’s Jonathan Orr stiff-arms Yorktowne’s Imeire Manigualt on his way to a touchdown in the final regular-season game on Saturday, Oct. 13, 2012, at Central York High School. For the first time this season, the Red Raiders allowed first downs and touchdowns, but defeated the Yorktowne Patriots 32-18. © 2012 by The York Daily Record/Sunday News. 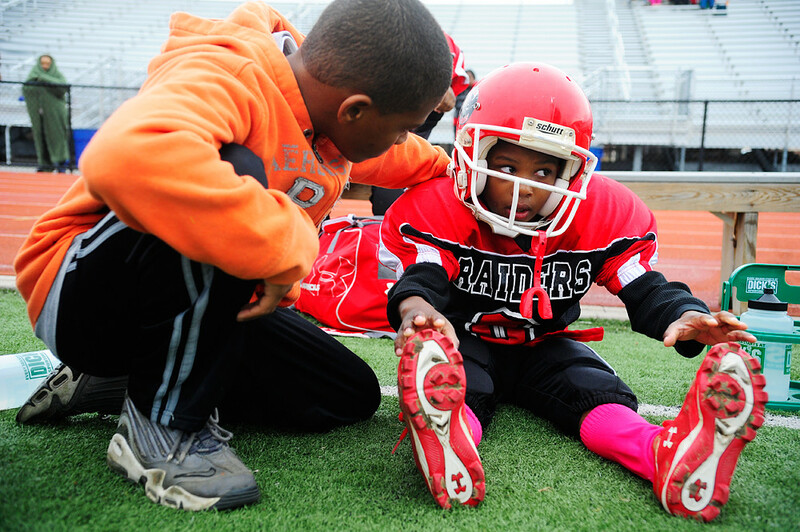 Andrew Miller, 11, encourages his nephew Zamir Weedon-Parker, 8, as Zamir stretches out after a long rush for a touchdown to bring the Red Raiders up 12-6 after the half against the Eastern York County Blackhawks on Saturday, Oct. 28, 2012, at Central York High School. © 2012 by The York Daily Record/Sunday News. 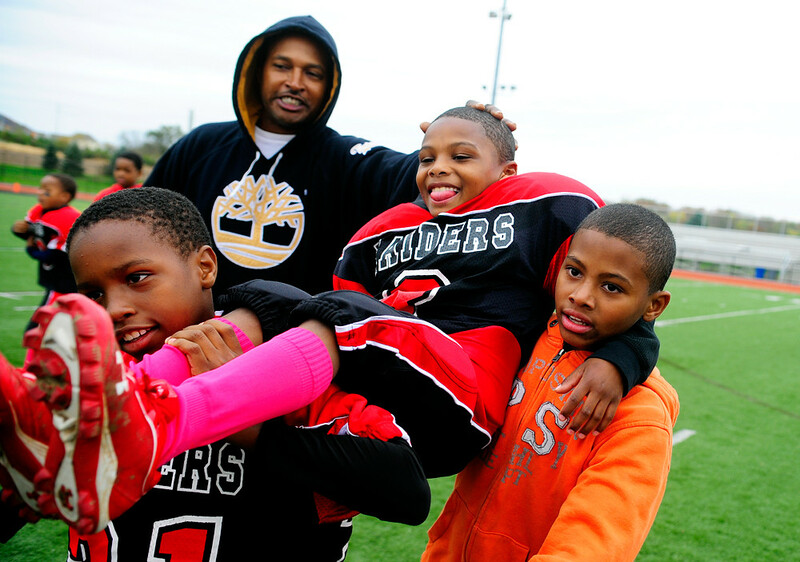 Zamir Weedon-Parker, 8, is carried off the field by teammate Mehki Workman, 7, and uncle Andrew Miller, 11, after the Boys Club won its semifinal game against Eastern York County on Sunday, Oct. 28, 2012, at Central York High School. © 2012 by The York Daily Record/Sunday News. 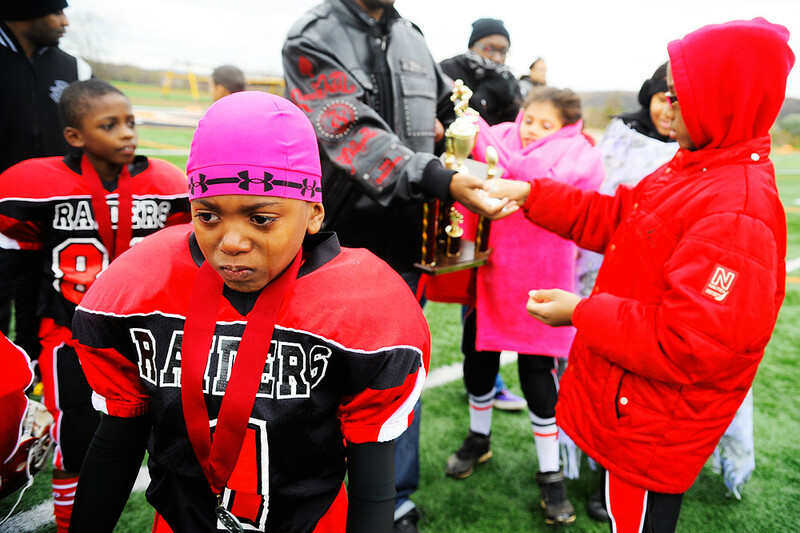 Nani Nieves, 8, listens to the Boys Club coaches’ post-game talk during a huddle after the Red Raiders defeated the Eastern York County Blackhawks on Sunday, Oct. 28, 2012, to advance to the York County Youth Football Association championship game. 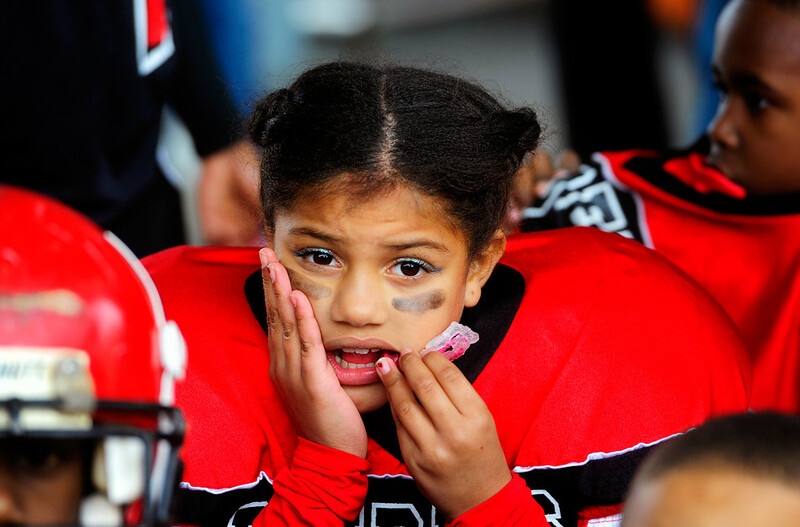 Nieves’ mother Neesha said she likes to wear makeup at home — and, evidently, while playing football. © 2012 by The York Daily Record/Sunday News. 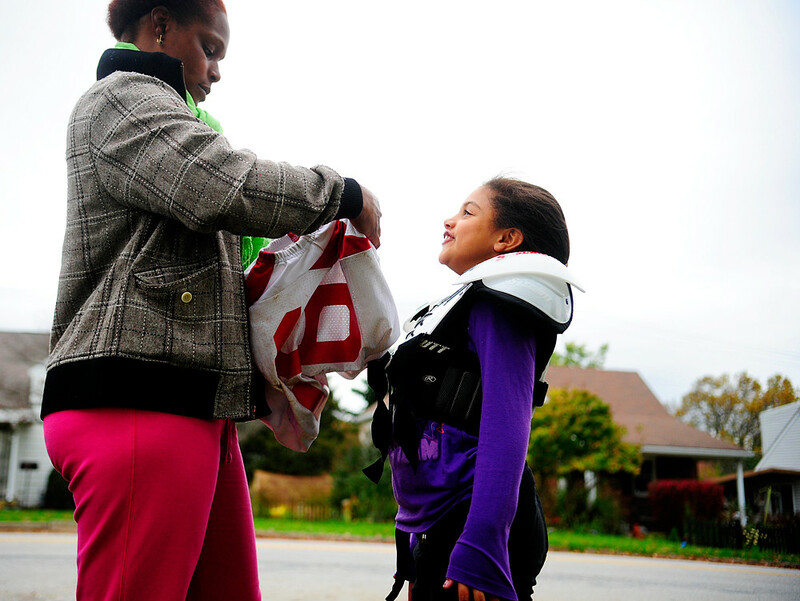 Neesha Nieves helps her daughter Nani, 8, get geared up for practice on Wednesday, Oct. 31, 2012. © 2012 by The York Daily Record/Sunday News. Boys Club rink varsity football players march down the track before playing the York County Youth Football Association championship game against West York on Saturday, Nov. 3, 2012, at Northeastern High School. © 2012 by The York Daily Record/Sunday News. 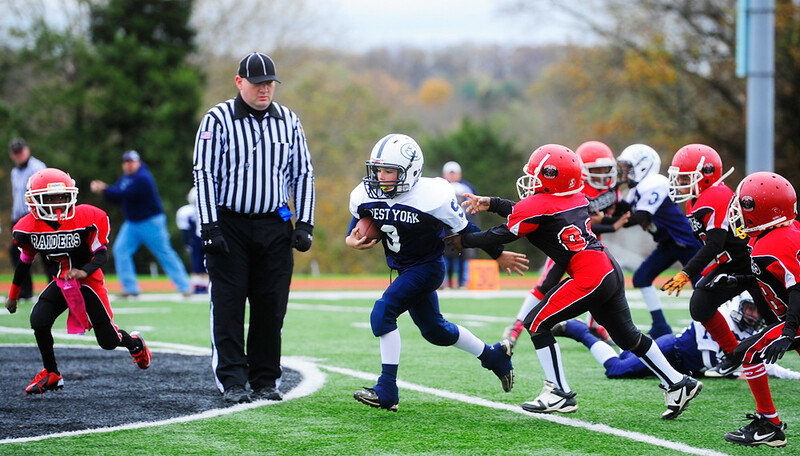 West York’s Connor Michael breaks past the Boys Club defense in the York County Youth Football Association championship game on Saturday, Nov. 3, 2012, at Northeastern High School. © 2012 by The York Daily Record/Sunday News. 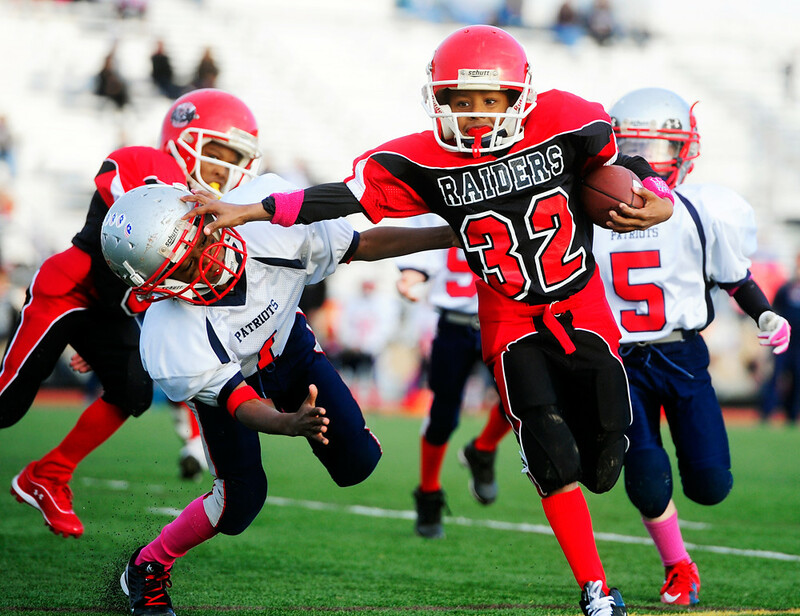 Boys Club rink varsity quarterback Kerry Glover, 8, leaves the field, tears streaming, after the Red Raiders lost the York County Youth Football Association championship game to West York on Saturday, Nov. 3, 2012, at Northeastern High School. “The hardest part for me was seeing the look on their faces,” said his father, also Kerry Glover, who is head coach.